4th Row: Michael Mead, Andrew Doudna, Sam Reynolds, Cole Hunt, Ben Vogel. 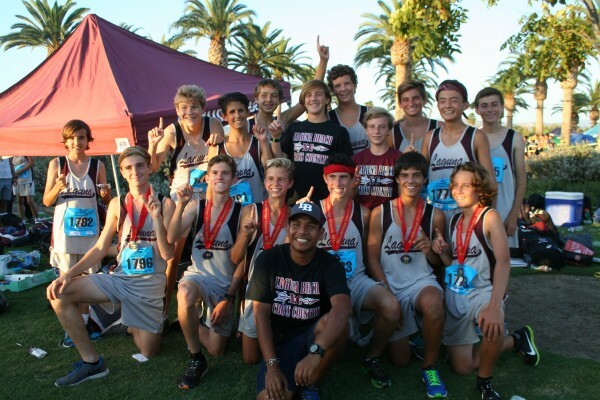 Laguna Beach’s Freshman Cross Country Team took first for the second week in a row. This time the 16 freshmen competed at the Woodbridge Cross Country Invitational where six finished in the top 30. “Congrats to the freshman team for another amazing victory at the Woodbridge Invite. This is one of the largest best invites in the country,” emailed their head coach from Oahu where the varsity boys and girls teams were away competing this weekend. Bravo to my former 8th grade goofballs/slash/amazing boys!